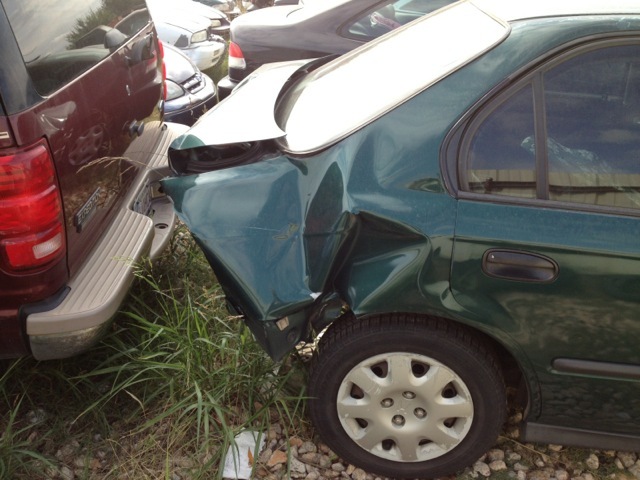 Nine days ago I was in a horrible car crash. I was sitting at a stop light, reaching for my little sliced cucumbers I had prepared for nourishment as I ran my errands, when all of a sudden, BAM, I was struck from behind by a truck going 50-60 miles an hour. I felt the brunt of the blow and the pain was otherworldly, as I felt myself being pushed over into the passenger seat. I felt the pain when my ankle was being broken. I was in a total state of shock as I laid there for awhile before opening my eyes and singing a little song about Jesus in my mind. The song was Jesus, Jesus, Jesus, Sweetest Name I Know. I had to lie there for a little while and thank Him for my life but wondering how this could have happened to me, especially since my scriptures from the previous days were "nothing shall by any means hurt you", and yet there I lay in excruciating pain in a devastating car crash. 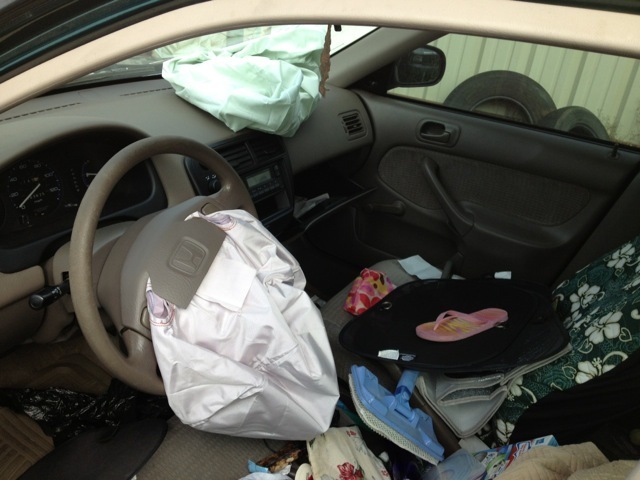 When I opened my eyes, I saw my airbags deflating on both sides of the seats. I smelled a horrible smell like smoke and thought the car was on fire and I thought it was going to blow up any second and I knew I had to get out of the car quickly. I knew I was going to have to crawl out because of my broken ankle. I managed to pull my body out with my arms and I crawled out and down onto a bed of soft green grass. I had been in the right lane and wondered how in the world I was on grass. I rolled over onto my back and laid there for help to come. I was already beginning to hear sirens; someone must have seen the crash and called 911. I was taken on a stretcher board with full neck brace in the ambulance to the emergency room to be examined, x-rayed, splinted and released into the care of my daughter. A couple of days later, I was having trouble with my heart pumping really hard as it tried to do its job of getting blood to the most injured parts of my body -- my ankle and brain. My pulse was so consistently high that it began to alarm me and at one point I could not stand on my feet anymore but had to go and lay down. I wondered if I was going to die this way from the accident. I wondered if the accident wasn't a precursor to my death. I am 65 years of age and I wondered if my heart was going to be able to hold up in this perishing body of mine. I was in the kitchen at the time I felt this way and I went into the living room to lie down on the couch. As soon as I lay down, I began to bring my mind to a rest in the Lord where there was no fear. I resisted the fear of death and began quoting familiar scriptures in my mind, like "though He slay me, yet will I trust Him". I thought on all the scriptures that came to my mind about trusting Him and I gave myself completely over to God to do with me as He will and then I went in my mind back to the beginning of when I first began to love God. I took Him back there with me and we began to journey together of our love affair from early in my life as a child and slowly moving through my life we stopped at particular loving times to linger and we had only gotten to when I was in my 20s when my spirit left my body and I was carried up, up, up and away. I didn't see anything until I was suspended in Space, held in the arms of God, much like a newborn baby is held and is brought to be presented to its father. I was suspended between Earth and the full presence of God and I knew I was being carried into this presence but before I went into that presence, I beheld Earth below, suspended in Space. It was amazing, spinning like a bright blue ball veiled behind puffy white clouds. I realized I was no longer of the earth and there was nothing of the earth of me. I looked on it with wonder, as I remembered all the strife and hate and war and politics and it all seemed so far away and small and confined to that one little sphere and because I was no longer of the earth, nothing of the earth had any pull for me. I was going into the presence of God. That was all that mattered. I hovered there for a while, I can't say how long, and then I was back in my body, lying on my couch and my first thought was, wow, we are in the world but not of the world. For the first time, I knew what that meant. For the rest of the day, I just meditated on that one verse and what it meant, as I began my new walk on this earth but not of it into the future with my loving God. 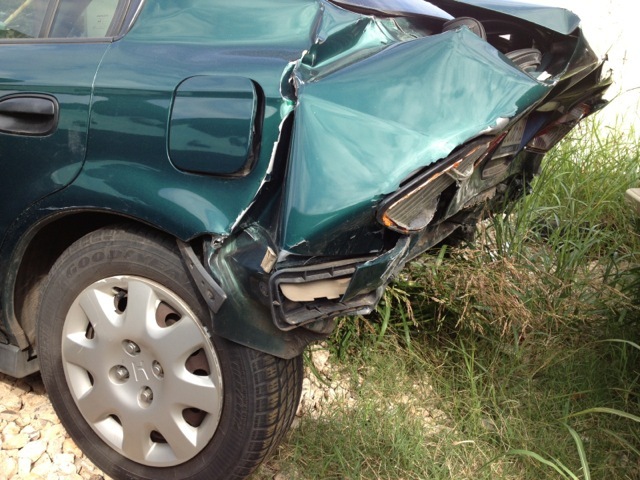 On the eighth day after my accident, I had another incredible experience with the Lord that I must write down. I dreamed I was in a sort of a compound with other people. The compound had a few houses in it and my house was big, with five bedrooms, and I shared it with others. We had been taken over by the communists or fascists or NWO, whichever, and they were giving us instructions and laws on every part of our lives -- what we were and were not allowed to do. They even had restrictions on picnicking. As I was marveling at this smallest of intrusions, that even our picnicking was to become an issue, I heard a commotion coming from our house and I went to see what was going on. One of the young girls had committed an offense against the rules. They were furious with her and instead of just taking her away, they rounded up the whole household and placed us in a van and took us away. We wondered and spoke amongst ourselves of what they might have in mind for us and they told us they were going to kill us. Shocked, we then wondered how they were going to do it. Then we pulled up to a field and we got out of the van and began down a narrow way to an open field that had individual fire piles burning all in a line in rows, much like a tree orchard, only this was an orchard of burning fires. We feared the worst. They planned to burn us alive. I listened as the others in the group begged for mercy not to be burned alive but to be shot. But, no, it was to the fires. Then I did not wait for them to put me in the fire. I left the little crowd behind and went boldly into the flames and threw my hands to Heaven, praying for Jesus to come and get me. I was more focused upon Heaven than I was on the flames. Although I could hear the flames and the crackling and the burning of flesh, I could not feel the flames, as my complete focus was on Heaven as I cried out for the Lord to come and take me. As I was crying, "Jesus, come and get me! Jesus, come and get me!" a misty white angel appeared in the heavens on my right. He had a huge wingspan. He wasn't clear to my eyes, only a misty white form. Then another misty white angel appeared on my left. They were coming and watching me as I continued my cry, "Come for me, Jesus! Come for me!" My faith had become sight; they were coming for me. Then the whole sky was filled with these misty angels and, suddenly, Jesus appeared in the center of all the angels in such royalty and majesty. He was standing before me in the heavens and He had a staff of light in his hand. When I saw Him, the first thing I noticed was the robe He was wearing. It was of such majesty, as I have never seen. Sort of like the robes you see on the big Christmas angels, only 10-times the material. His robe was royal and regal and indescribable. I was amazed that I could see it with such clarity. I could even see the folds of the fabric. There were folds and folds of fabric. I wondered if He would let me see His face as clearly as He was letting me see His robe. I began to lift my eyes to see His face. To my utter surprise, He let me see His face fully and clearly. His whole form was so clear. I can't stress that enough. I stared for a long time, taking all of Him into my eyes and marveling that He was letting me see Him so clearly. In the past, I have never been allowed to see Him fully, only parts of Him. But here I was seeing Him clearly. Then I cried to Him to take me, take me, take me. But He didn't take me. He took His staff of light that He was holding in His left hand and raised it up and threw it down to me and I watched it as it slowly began to fall, fall, fall, down, down, down, in slow motion, until it fell on top of me. Immediately, the vision of the heavens open was gone and all my heavenly visitors and my king were gone and with their departure my tormentors were dragging me from the fire, disappointed that the fire did not kill me. They took me to a room and dressed and bandaged my burns and then they tried to kill me another way by forcing poison on cotton swabs down my throat and coating my tonsils with it, but I still would not die for them. Again, they tried another cotton swab soaked in this virulent and potent poison and swabbed my tonsils once again, as they were conversing among themselves about the potency of the poison, and this time it had to work; they spoke of how it was a real killer, but still their efforts were in vain. Then they tried kicking and beating me and stomping on my head, but still I would not die for them. Finally, they had to let me go and then the dream took me through various dangerous situations, from which I escaped all. Then I heard a knock at my front door and the knock woke me up. It was 6:30 a.m. and I jumped up, remembering I had an engagement at 8 a.m. and needed time to get ready, as I was hobbling on crutches with a cast, so it took a long time to prepare for my exits. I rose and looked out my door and there was no one there. It was the Lord waking me from the dream for my appointment. I, Thalia Dowling, testify that these are true events that happened to me within the week of 10/17/12-10/25/12.